This recipe really surprised me when I first made it. I think it is because of the combination of the caramelised squash with the garlic and crunch of the pine nuts. It is delicious hot or cold. Tuck in! If you are allergic to nuts, including pine nuts, then please leave this ingredient out of the recipe. Quarter the butternut squash, remove the skin and seeds and dispose of these. Chop the squash into small cubes. On a baking tray covered with foil, sprinkle on the squash and garlic. Drizzle 2 tablespoons of oil over the squash and stir thoroughly to coat. Cover with foil and cook for 15 minutes. After this time, remove the foil. Put the squash back in the oven for a further 30 minutes, or until slightly crispy and caramelised. In a wok, gently fry the courgettes in a little oil, so that they still have some bite to them. In a small frying pan on a low heat, dry toast the pine nuts (without oil) until just golden. In a very large pan, add about 4 litres (135 fl oz) of boiling water for every 250g (8.8oz) of pasta. Stir gently and simmer on a medium heat for about 8 - 10 minutes until cooked. Drain the pasta into a colander and rinse well with boiling water. 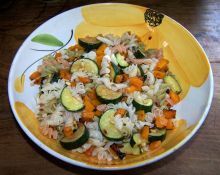 In a large salad bowl, add the pasta, courgette, squash and pine nuts. Squeeze the half of lemon over the mixture and a tiny drizzle of olive oil. Toss thoroughly with salad servers and serve immediately.